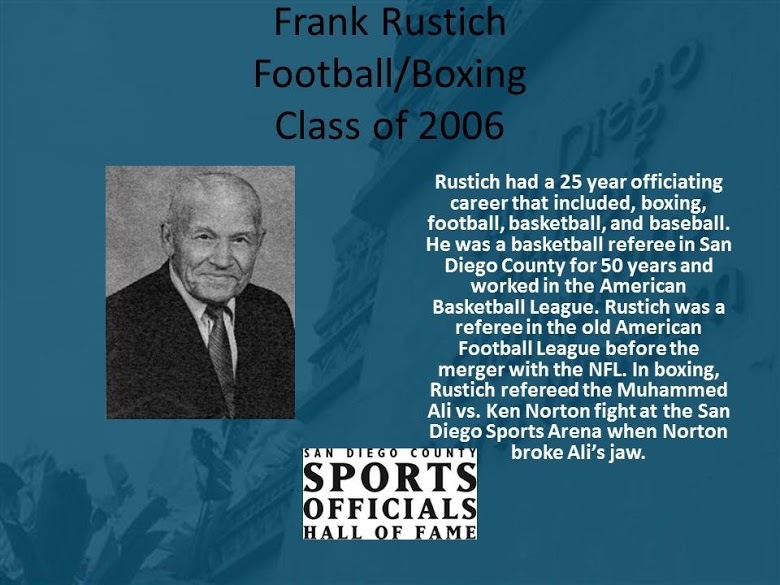 A three sport star at Lackawanna High School, who went on to play basketball and football and compete in boxing at Canisius College (1935), Frank Rustich is best known as a highly respected professional football and boxing official. It is estimated Frank officiated some 10,000 contests in his lifetime, which included eight years in the old AFL (1961-68) and 227 professional fights. His most memorable time between the ropes occurred in 1973 when he was the “third man in the ring” for the famous Muhammad Ali vs. Ken Norton fight. That was the afternoon Norton broke Ali’s jaw on his way to winning the NABF Heavyweight title. He was both a line judge and a referee in the AFL. After retiring, he served the NFL as an evaluator and he helped the United States Football League pioneer the use of instant replay, where he reviewed debatable calls in the booth and had the authority to reverse decisions of the on-field officials. His early success was also on the gridiron where he was an All-Niagara Frontier League player for Lackawanna. He briefly played basketball at Canisius, however he made his mark for the Golden Griffins on the football field where his prominence as a running back led him to a 1974 induction into the school’s sports hall of fame. He played one year of professional football (1936) for the Boston Shamrocks in the original American Football League and he had a brief coaching career at Lackawanna HS. A member of the Lackawanna High School Athletic Hall of Fame and the San Diego Sports Officials Hall of Fame, Frank passed away in 1994 at the age of 81.